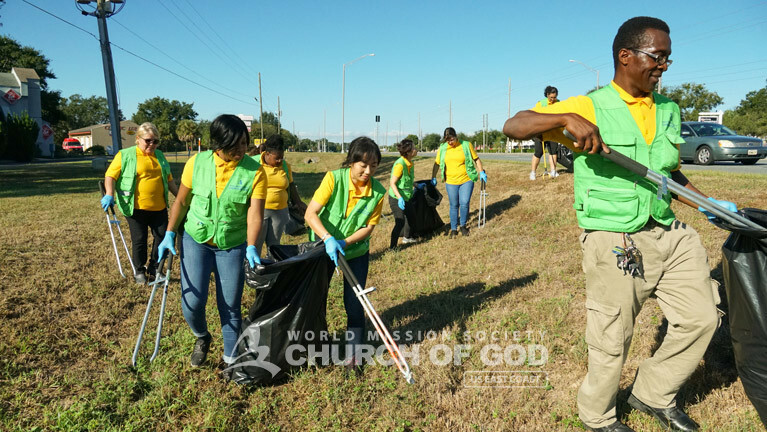 Around 50 volunteers from ASEZ and the World Mission Society Church of God came together for a Central Florida cleanup. The cleanup was a part of the worldwide “Mother’s Street” campaign and “Reduce Crime Together” initiative. ASEZ (Saving Earth from A to Z) is the Church of God’s international university student volunteer program. The purpose of “Reduce Crime Together” is to create a safer human society by reducing crime through cleanups and other volunteer service activities. All human beings seek to accomplish dreams and goals; they want to bring happiness to themselves and to their loved ones. Ultimately, they want to live a life that they can enjoy. However, our joy is sometimes taken away because of crime. Statistics show that one person is killed by another every single minute. However, statistics also reveal that crime rates drop dramatically where public order is kept and the environment is clean. In order to promote awareness to this cause, ASEZ university students are carrying out the “Reduce Crime Together” initiative. 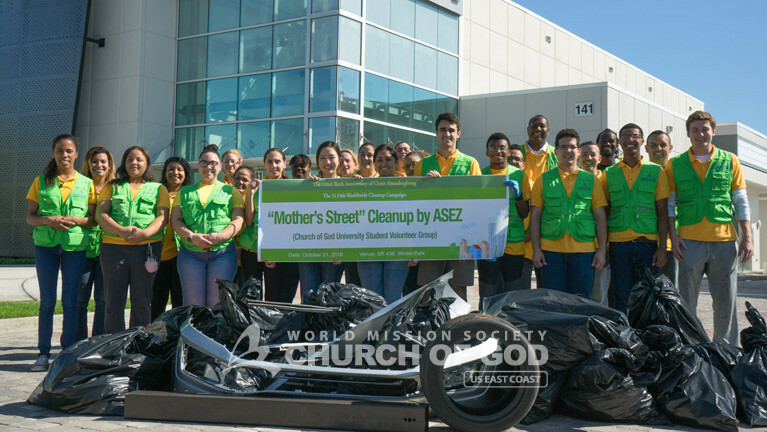 This street cleanup project is also taking place in over 7,000 regions and 800 universities as part of the “Mother’s Street” movement. Real peace can be achieved only through a mother’s love; the Church of God’s solution to prevent conflict and crime is loving 7 billion people of the world with the heart of Heavenly Mother. This time, on October 21, ASEZ held a Central Florida cleanup day at two locations simultaneously. ASEZ members worked with the Florida Department of Transportation to narrow down each area. There were students from the University of Central Florida (UCF), Seminole State College, Valencia College, Rollins College and Full Sail University. 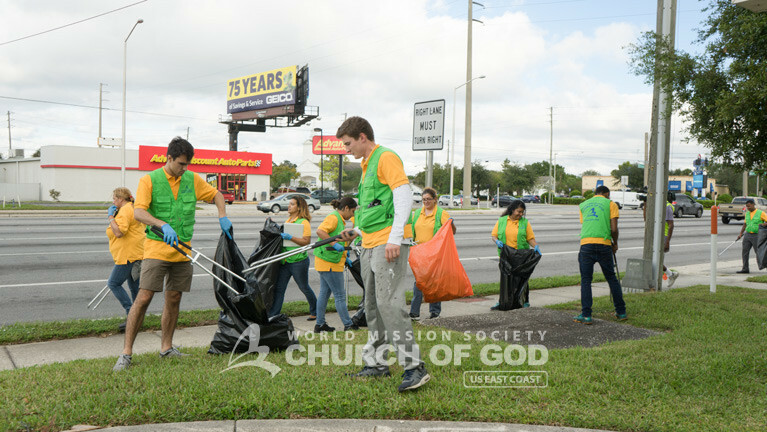 One group cleaned State Road 436 from Hanging Moss Road to Bishop Park Drive, near Full Sail University in the city of Winter Park. The other group cleaned US Highway 441 from Eudora Road to Donnelly Street nearby Lake-Sumter State College in the city of Mount Dora. Upon arrival, the volunteers grabbed gloves, trash bags and trash pickers, and went straight to work. They collected things like soda cans, plastic and glass bottles, tires, broken chairs, car parts, cigarette cartons and buds, pipes, old signs, and other garbage. Moreover, the volunteers filled up a total of 36 55-gallon trash bags between both venues. ASEZ is an international volunteer group consisting of young adults who are university students and members of the World Mission Society Church of God. They organize and perform numerous community services in various fields. Members are involved in disaster relief and environmental protection efforts in the 175 countries where the church is located. ASEZ’s vision is to unite young adults across the globe. Furthermore, their desire is to bring about a bright future for all 7 billion people. The group receives support for its activities by establishing partnerships for worldwide participation. Through these partnerships they strive to strengthen global communication and initiate the conversation for crime prevention and other issues. ASEZ believes the world will change only when people change. ASEZ volunteers are taking the first step by changing themselves. Their hope is that others will follow suit for the betterment of the world.